I can definitely see the Hall of Fame’s viewpoint because it was the original lineup and the stuff they did in the 1970’s that put them on the map than any other lineup. However, if we’re talking members who had their own personas then I’ve said from the beginning that both Eric Carr and Vinnie Vincent should be inducted as well. I can see Ace and Peter agreeing with the Hall of Fame’s viewpoint, but Paul and Gene are on the other side of the fence. Kiss after the original line up was just another 80s hair band. They would not have made it where they are if that original line up hadn’t blown us all away. Ace already tried that with the HoF and they turned him down. Hold on – Vinnie and Eric had different personas and Bruce never wore makeup and I don’t think St. John did either – so why are they not being inducted?? Why is nobody standing up for Eric and Mark?? If Paul and Gene were decent – they would – but all they care about is the present members and the deceased members are cast off like ex wives. We can go forever about this situation. KISS is an institution that should be recognized. The problem also is that there have been on occasion of un-credited musicians who have put their stamp on the finished product, in which, should be honored as well! With that being said, KISS would NOT be where they are WITHOUT the fans (ie.., albums, condoms, cologne and caskets).. So for that reason…, that’s why they SHOULD play the Hall Of Fame! As a celebration of years of support between the band and the fans. Let’s be honest. Whether the RNRHOF or KISS got their way on who is or is not allowed to perform, they’d likely perform yet another uninspired version of Rock N Roll Night which no one with ears needs to hear. I am a 30 year KISS fan. My loyalty, much like Trunk’s, has waned over the last decade or so. They’ve won me back a little with their latest albums, especially Monster, but this whole situation is absurd. If Paul and Gene (and possibly the RNRHOF) are sincere when they say this matters only for the fans, they’ve done a hell of a job of making the entire experience one that I wish would just go away. 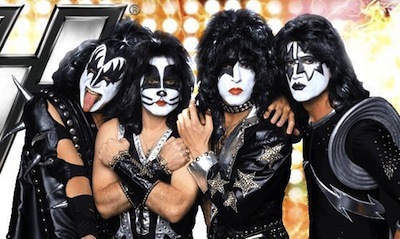 There is no denying Tommy Thayer and Eric Singer are exceptional musicians. But when you march Repl”ace”ment Frehley on a stage don’t get pissed at people for not buying into it.